Racing_Green_Translucent_Envelopes__Paper is rated 5.0 out of 5 by 2. What does translucent mean? Picture makes sheets look solid. It is see through, with a tint of the racing green color you see. 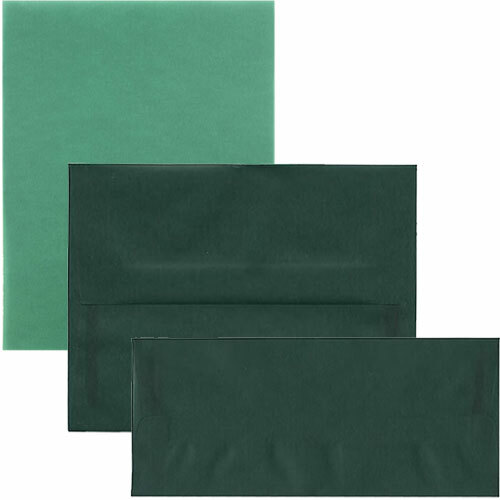 You'll certainly get those pulses racing with these Racing Green Envelopes! The beautiful, rich, deep green combined with the translucency that it comes with, and everyone will be intrigued to say the least. Translucent Envelopes allow your recipients to see what’s inside, before they open it up. This way you can give your invitation, announcement, or card a rich green overlay. Use a complementary color inside the envelopes for mail so pretty, it’ll look like art. Translucent Envelopes are made with natural vellum paper, which is made from pure cellulose fibers for the best quality. These envelopes are also acid free as well as recyclable. Matching 8 1/2 x 11 30lb Racing Green Translucent Paper and 43 lb Racing Green Translucent Cardstock is available. So when you really want those pulses racing, you can combine the two for a great stationery set.